Pokhara—Safal Expo Pokhara and the third Mobile Festival 2075 has kicked off in Pokhara on Thursday. 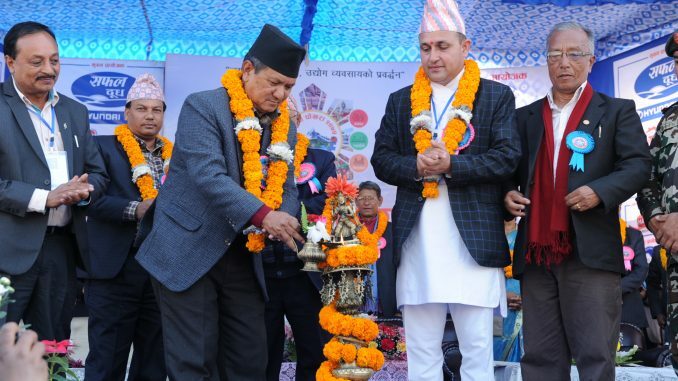 Gandaki Province Chief Minister Prithvi Subba Gurung inaugurated the expo organized by Pokhara Chamber of Commerce and Industry at Pokhara Exhibition Center in Naya Bazaar. The expo that will be going on till December 10 has around 300 different stalls including 20 industrial ones. 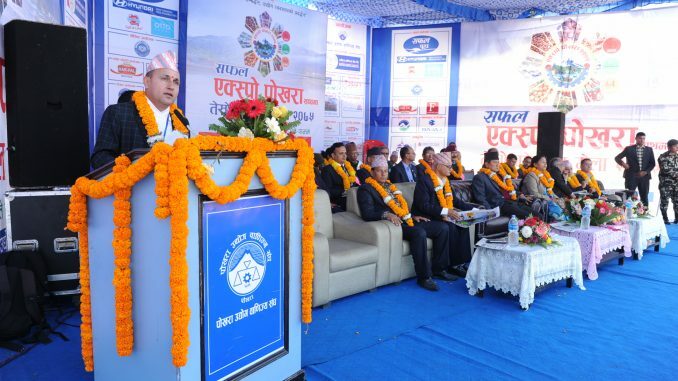 Addressing an inaugural ceremony, PCCI Chairman Damu Adhikari informed that the development entrepreneurship through the meeting of producers and costumers in a common venue was a key motive of the expo. He further made clear that the marketing, exploration and promotion of goods and services regarding industrial, agro, handicraft, IT, educational, health and tourism are also the objectives of the festival. Productions of Pokhara Industrial Estate, mobile phones and related accessories, tourism related stalls, made in Nepal pavilion, garment and grocery items, stalls of floriculture, auto expo, restaurants and children park are key attractions of the expo. 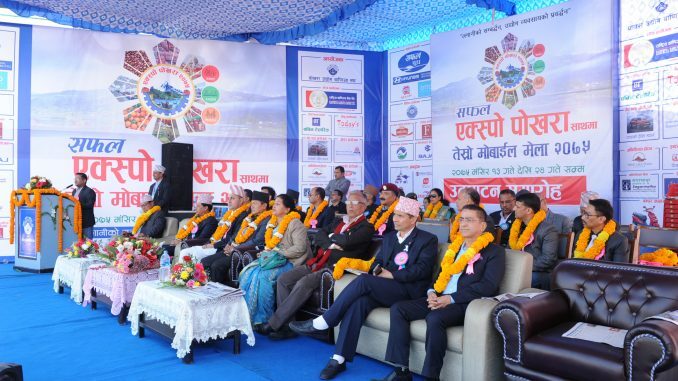 Inaugurating the expo, CM Gurung asked the private sector to support the mission of prosperous Gandaki Province. He also vowed that provincial government is committed to create conducive environment for the establishing of industries. 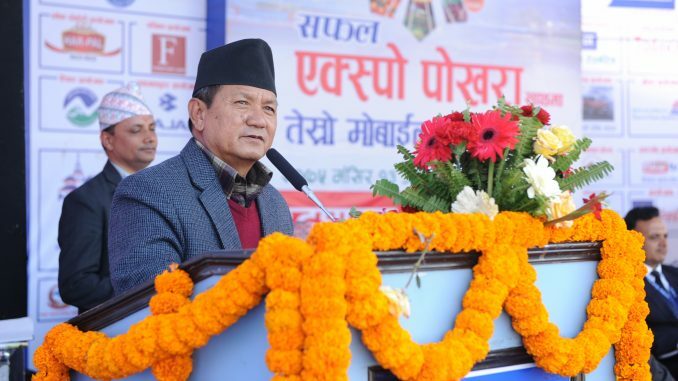 Saying that his government is serious for the security of industries and businesses, CM Gurung said that the government also was sensitive to develop the one door system for the registration of industry. Federation of Nepal Chamber of Commerce and Industry former chairman Anand Raj Mulmi said that the lack of good governance and coordination among three tiers of government were dissatisfying the entrepreneurs. PCCI senior vice chairman Narayan Koirala, Tanahun Chamber of Commerce and Industry chairman Mankaji Shrestha, main sponsor Laxmi House executive director Sunil Shrestha, FNJ Kaski chairman Dipendra Shrestha and PCCI general secretary Arjun Pokhrel put their views during the program. Chiuli Parche mother group Matepani, Tershapatti Jalbinayak mother group and Durga Bhagwati Women Group Sridhara got first, second and third prize respectively in cultural rally demonstrated before the program.